The Punta del Este Airport is one way you can reach the luxurious resorts in this coastal region of Uruguay. Each year thousands of visitors take advantage of the efficient and friendly service offered by the airport commonly known as El Jaguel. 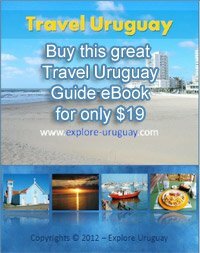 If you are considering a trip to some Punta del Este Uruguay beaches, it may help to become a little more familiar with the various types of transportation available, particularly when it comes to air flights. These flights into Punta del Este provide you with the opportunity to witness the scenic beauty of the coast. You will clearly be able to see where the Rio de la Plata flows along one edge of the peninsula and contrast these waters with the turquoise waters of the Atlantic Ocean on the opposite side of this southern Uruguay peninsula. Visitors cannot help but feel a thrill of excitement as they catch glimpses of some of the beaches such as the beautiful Playa Mansa, La Barra, Playa Brava or Bikini Beach. You should check on possible flight schedules and reservations of this international airport as soon as possible because many of the available flights are booked weeks or months in advance. While this seaside resort community usually is home to less than 10,000 full time residents when the peak tourist season arrives the number of residents can easily exceed 150,000. These large numbers can strain the resources of many airlines but Uruguay can call upon the services of a number of flight services including those offered by employees at airports in Maldonado, Montevideo and Punta del Este. The country is proud that its transportation companies are able to blend their efforts and work together to handle the influx of tourists while still providing for the travel needs of the people of Uruguay. In addition to the Punta del Este Airport and the Montevideo International Airport there are also a number of other cities in Uruguay which are served by a variety of different airfields. There is the Artigas International airport in the city of Artigas and a smaller, landing strip in Carmelo Uruguay. Even Fray Bentos, Paysandu and Rio Branco have airports available. Unlike the 8800 foot paved runway found at Montevideo Carrasco International the runway at Punta del Este is a little shorter. Still the nearly 5000 foot runway is quite capable of handling a variety of aircraft. You will notice that a large number of private planes fly in and out of this airport on a regular basis. The Rio Braco Airport and the Punta del Este Airport do not require any customs check for arriving guests but you can expect to walk through customs at all other airports in Uruguay. Upon arrival in Punta del Este it will be only moments before you can disembark from the plane and set off to explore the city.